SAPPORO - Japan striker Musashi Suzuki bagged a hat trick as Consadole Sapporo thrashed visiting Shonan Bellmare 4-1 in the Levain Cup on Wednesday night. The recent Samurai Blue debutant completed his hat trick 20 minutes into the second half of the Group A clash at Sapporo Dome after scoring twice before the break. Suzuki’s first-half brace bookended 18-year-old teammate Riku Danzaki’s first professional goal. The youngster, who has yet to make his J. League debut, joined Consadole out of high school at the start of the year. Brazilian midfielder Leleu cut into the deficit for Bellmare five minutes into the second half. The victory is a welcome turnaround in form for Consadole, who have lost four of their six J. League games after starting the season hoping to improve on their fourth-place finish last year. The result leaves the Hokkaido club on top of Group A after Yokohama F Marinos and second-division V-Varen Nagasaki drew 2-2 at Nippatsu Mitsuzawa Stadium. In other results from the third leg of league cup matches around Japan, Vegalta Sendai beat second-division Kashiwa Reysol 2-1 at Yurtec Stadium to remain on top of Group B with three wins. 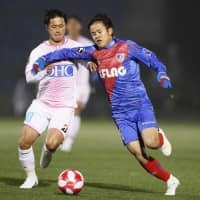 Third-place FC Tokyo beat Group B cellar dwellers Sagan Tosu 1-0 at Prince Chichibu Memorial Rugby Ground, in the first soccer match to be played at the home of Japanese rugby since the 1964 Tokyo Olympics. Seventeen-year-old star Takefusa Kubo struck the winner with a spectacular free kick in the 84th minute. “I felt like I absolutely had to score. I’m thankful it went in,” said former Barcelona junior Kubo, who is likely to represent Japan at next year’s Tokyo Olympics. Fittingly, the match was held at Prince Chichibu Memorial Rugby Ground while FC Tokyo’s regular home turf, Ajinomoto Stadium, is undergoing renovations during the week for its use in this year’s Rugby World Cup. In Group C, first-place Vissel Kobe secured a 2-0 win against visiting Oita Trinita despite resting all of their big-name European contingent. Elsewhere in the group, Kota Mizunuma struck a first-half brace as Cerezo Osaka overran visiting Nagoya Grampus 3-0. With four points apiece, second-place Grampus remain ahead of Cerezo on goal difference. Jubilo Iwata hold top spot in Group D following a 3-1 win away to Matsumoto Yamaga, with Masato Nakayama scoring the second of his two goals in the stoppage time. At IAI Stadium, second-place Shimizu S-Pulse were held 1-1 by Gamba Osaka. The two clubs are tied for second with four points apiece.